Ah, yess, Malcolm MacDonald! I recall him sitting in our much-commented front-row ( ) back in 1995 - scores on his knees. But he didn't need them, he was nodding and humming all through the 50 minutes or so of the orchestral parts of The Tigers - knowing all of it by head, no doubt. (Btw, I also recall Bisengaliev playing the whole develishly difficult Violin Concerto by head - and even better than in the recorded version). I think that it was Harold Truscott (also the composer of a fine symphony) who wrote about the sense of hard-won victory at the end of Brian's 10th. Robert Simpson also wrote eloquently about Brian. From C major to D minor by way of F sharp, all in three triads: it is the sensational juxtaposition of C and F sharp that is so exhilarating [and shocking, terrifying--Sarge]. Brian has discovered his full powers. He can stride from one end of the tonal universe to the other in a split second: he can make a single cadence bear the dramatic weight of an entire movement. This is the victory of imagination over form. Back in D minor the music rises to a pinnacle of grandeur before all the instruments hammer home the chord of D, fortissimo, only to be shut out with heart-stopping suddeness. There is a pause, then quietness--a high tremolo in the violins, a soft meditative glow from the bassoons, barely audible timpani to assure us the world is still spinning. Part I of the Gothic ends in a serenely spaced D major triad, adorned with harp arpeggios." There are three books I've considered absolutely essential in my developing appreciation and understanding of classical music: Charles Rosen's The Classical Style; Robert Simpson's The Essence of Bruckner; and MacDonald's.
. . . This is the victory of imagination over form. Any first-year theory student who gets his wrist slapped for following one chord in root position, with another root-position chord a tritone away, just needs to cite Brian as a precedent. Absolutely! MacDonald brings it alive. Prompted by this thread, actually, I reread the first chapters of the book this morning, and was bowled over again by the prose. It's simply exciting reading. I was very close to quoting exactly the passage you just did, and also the couple of paragraphs before it - it's one of those sections that is a joy just to read. In MacDonald's writing, unsurprisingly, similar metaphors return - the score as a battleground, scene of catastrophe and tragedy, and also the celestial mechanics theme - that passage describing the central point of the Gothic's Vivace, for instance, where he talks about the veil being lifted and the engine within being revealed. He gets it spot on. The introduction, too, I was reminding, is sterling stuff, making all the right points succinctly. Students aren't allowed to break the rules. The genius-composer knows he must break the rules. Uhhh, I was taught that until you can master the rules you are not allowed to break them. Again, we'll have to disagree, PW. I'll just say Brian was well-thought of by his contemporaries. The man knew how to compose great music...not to your taste, I understand. I'm British and I just like the noise he makes. Then, suddenly, will come a lyrical passage so beguiling...and short! And Brian had mastered them. Witness his immense and complex Double Fugue for piano -itself, though, just a practise-piece for the Gothic - or, indeed, the amazing counterpoint of the Gothic's choral pages (such as the In te Domine speravi chorus - wow!). That blinding chord sequence is thoroughly justified - as MacDonald says, on tonal and also a kind of serial basis - in what comes before. The tonal trajectory of whole piece is masterfully planned down to the smallest details. 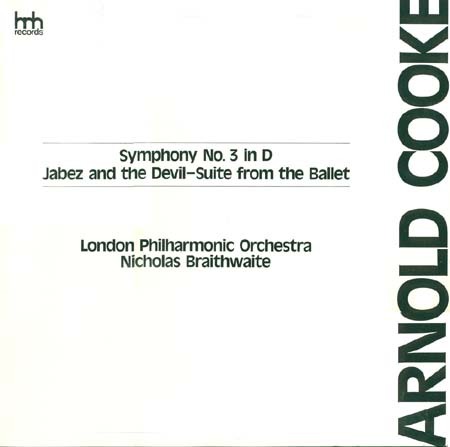 Brian's Symphony 6 and 16 will be coupled with Arnold Cooke's Symphony 3 on Lyrita. No it doesn't. It encapsulates my feelings exactly. The brief lyrical passages go, almost, unnoticed as one endeavours to catch one's breathe after the brilliantly organised "cacophony." Interesting. I have the LP of the Cooke. Great news! I didn't hear any of those three symphonies for 25 years, though I could still whistle the opening and especially the tragic finale of the Sixth from memory. The good news being the coupling: I remember to have had a special liking for Cooke Three, and look forward with anticipation to its release. I do, seriously, believe your home is HMV, Oxford Street. From the recordings made of them, Brian's works display mostly empty grandiloquence (Gothic and Siegeslied symphonies), or, alternatively, clumsiness in orchestration as well as muddled structures and ideas. Try as I might (and as a lover of 20th century English music I REALLY have tried), I find very little of true distinction here. Brian is overrated. His most accessible work is certainly the Violin Concerto. Since he's not performed in our concert halls, not recorded, not championed by any famous conductor, not discussed in music magazines and has a miniscule fan base, I'm at a loss as to how he could possibly be characterized as overrated. how he could possibly be characterized as overrated. This thread is trying as hard as it can to rate him high, that's for sure. Personally, I wish you'd let the hack lanquish among the dregs. Honestly, the 'clumsy orchestration' and the 'muddled structures' are apprehensible as such only if one approaches Brian expecting 1) another [English] Romantic/Romantic Symphonist and 2) one who isn't all that good anyway, and probably a bit of a crank. As I wrote earlier in this thread, Brian is most obviously approached in this way, and with a certain dubious lack of either trust or positive expectations. I had my own moments of being unsure, I must admit it, as I got to know some of his symponies. But one has to trust him - one has to trust that a musician who was much respected by his peers - by Strauss, Elgar, Bantock, Henry Wood and so on - and who conductors such as Boult, Mackerras, Charles Groves etc saw fit to conduct must have quite a bit going for him. But this is appeal to higher authority, and I concede that as an argument it isn't enough. I can only repeat and emphasize what I've have already said - that approaching Brian as a Romantic symphonist won't do. One has to make the leap of faith, to trust that, whether he is seen as a major figure or not, his music is something very different from anything else of the time, and shouldn't be listened to as if in competition with composers who are, in essence, working in totally different directions. The more I listen to Brian the more convinced I am that he had an astonishing and completely original formal sense - it's just that there's absolutely nothing out of the textbook about it. He thinks things through - feels them, I should say - from first principles: a work like the 8th symphony, which I keep touting, is based around a dialectic as strong as anything in Mahler, but rawer and more extreme. Here the form is a simple one: two types of material, one violent, aggressive, martial, one lyrical, vulnerable, potentially ecstatic, are shoved up against each other, and the work procedes as a series of ever-more-extreme cross-cuts from one to the other. The aggression grows more destructive; the lyricism grows more desperately ecstatic - but the two need each other to work, they seem more dramatic or more vulnerably beautiful only in relation to each other. The music works centrifugally, until it spins off into two passcaglie which are an unexpected yet totally logical release. This is a totally convincing form, a simple one which is instantly sensed, but also an original and new one. Each of Brian's symphonies works in this way - he juxtaposes not just motives but also musical types, and he is extremely sensitive to the implications of what he writes, which is why you won't find one symphony which is structured in a conventional way. When he approaches such forms - as in the 9th symphony, or the 3rd - it is still clear that he is doing so from first principles, not simply filling a template - in this at least, he is closer to Beethoven than to many later Romantics. The 'clumsy orchestration' is something I've already talked about. In the first place, I don't see that a composer of something as texturally delicate and yet complex as, for instance, the second movement of the 3rd symphony could ever be accused of clumsiness; in the second place, I would just repeat that the 'clumsy' 'lumbering' sound, which is certainly present throughout Brian's music, is absolutely deliberate. One can conjecture about its 'meaning' - my own feeling is that Brian had a horror of brutality, of regimentation and of mass action, perhaps fostered by his WWI experiences, and the militaristic sounds which lurch destructively across his scores, (often triumphantly, but also emptily and ironically as in Das Siegeslied and many, many other pages) are an echo of this - but the texture is too omnipresent for it to be a miscalculation. There is also the registral and timbral fragmentation which is a hallmark of Brian's - we see it emerging in the second movement of the Gothic, and if one traces it from there, where it evidently works but sounds very peculiar, it is clear that it is a fundamental characteristic of Brian's without which his music wouldn't be Brianesque. One may not like it, but that's another matter; in itself it doesn't make him a bad composer. Essentially, I feel that understanding Brian is a little like letting one's eyes make the adjustments necessary to take in a pointilliste or impressionist painting; IOW, to look in a different way, not to work around stylistic assumptions made on the basis of musical period, or country. I'll freely admit that I had to go through this process before I really fell for him - and I'm one of those who didn't struggle upon first contact with Boulez, Xenakis et al. Brian's main problem is that his pieces are symphonies - which leads newcomers to expect things which aren't to be found, though his symphnoies are more symphonic through and through than almost anyone else's. It's clear to me that, once his basic terms and conditions are agreed to - his formal methods accepted, his orchestral sound understood - Brian is revealed as a very powerful figure. In this he is only like Mahler, or Sibelius (he's a lesser figure of course, in the end, though I'm not sure that in many ways he isn't their equal - he's certainly a born, gut-instinct musician like them, not a production-line one). It's just that his traits are at first more obscure and puzzling than theirs - his music draws its energy and onwards power, at every moment, from contrast and juxtaposition, and it makes for hard listening at first.